Pete Carroll responded directly Monday to reports of a rift between himself and running back Marshawn Lynch, saying, “I don’t know where that came from,” and scoffed at the idea that the Hawks would consider trading Lynch. Both ESPN and NFL Network reported Sunday morning that the Seahawks had grown tired of Lynch’s attitude and had already decided to move on from him after this season. The ESPN report indicated that the Hawks might have tried to trade him if Derrick Coleman had not broken his foot last week. 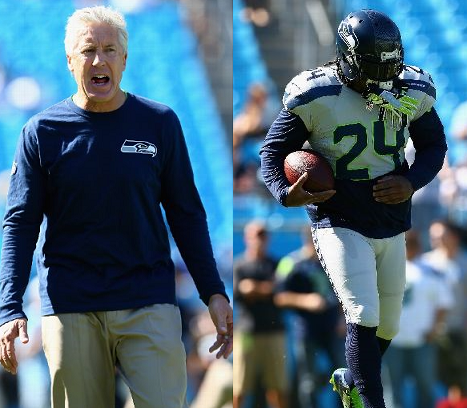 Amid reports that some teammates are jealous of quarterback Russell Wilson and that the Seahawks are ready to part ways with Marshawn Lynch, coach Pete Carroll and Wilson declared Sunday after they beat Carolina that the team is not distracted. 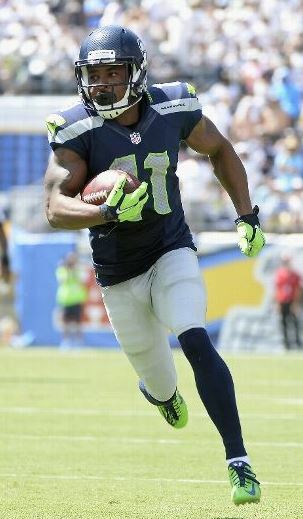 In the wake of the Percy Harvin trade and Mike Freeman’s incendiary report on Wilson, the latest revelation is that the Hawks’ relationship with Lynch has reached a breaking point, with the team finally tired of the running back’s antics and Lynch apparently so upset with the team that he is talking about quitting again. 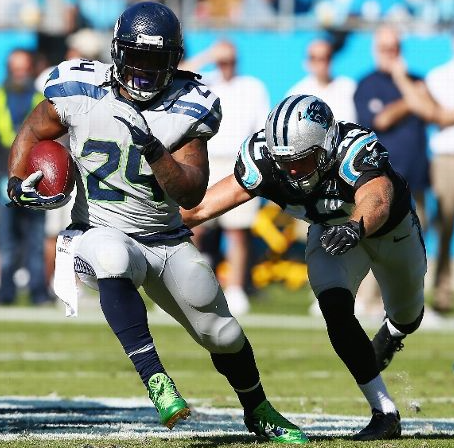 Seattle might even have tried to trade Lynch by Tuesday’s deadline if fullback Derrick Coleman had not suffered a broken foot last week, ESPN’s Chris Mortensen reported. With Coleman out, though, the Hawks have to use No. 2 tailback Robert Turbin as their fullback. The Percy Harvin Debacle was a great lesson for Pete Carroll and John Schneider: They learned just how fragile the psyche of their young Super Bowl team still is. And they probably learned which other malcontents they are going to need to send packing to make sure their team remains a Super Bowl contender. This was bound to happen. Carroll and Schneider have flirted with this kind of danger ever since they came to Seattle — bringing in bad apples such as Terrell Owens, Braylon Edwards and Kellen Winslow while courting chuckleheads such as Brandon Marshall and Vincent Jackson. Adding those kinds of idiots to a young team is always a huge risk — too many impressionable kids on your team. Harvin apparently swung a few of them his way in his 19 months in Seattle. The Seahawks’ stunning trade of Percy Harvin says a lot about John Schneider, Pete Carroll, Darrell Bevell and the entire franchise. They were naïve, hopeful, enabling and nearly self-defeating, but they also realized what a colossal error it was and probably made a great move — however shocking it was — in order to save their offense and season. The ill-advised decision (we said it then, so we can say it now) to trade for Harvin and give him a $67 million contract last year was easily Schneider’s biggest gamble since he and Carroll arrived in 2010. And, unsurprisingly, the GM lost big time.